When Aston Villa were relegated from the Premier League in April 2016, caretaker manager Eric Black spoke of the potential for the club to fall into "anarchy". In an attempt to halt the decline, Villa's spending in 2016-17 has exceeded £70m - more than the total paid on transfers by nine top-flight clubs - and they appointed a manager, Steve Bruce, who has won promotion from the Championship four times. With Bruce in charge and the most expensively assembled squad in Championship history at his disposal, Villa ought to be targeting an instant return to the Premier League. Instead, back-to-back wins over Derby on Saturday and Bristol City on Tuesday - their first of 2017 - were required to lift them to the relative heights of 15th. They remain closer to the relegation zone than the play-offs, but fears they could be involved in a relegation battle have eased, for the time being at least. Their prospects look brighter now but a rare good week on the pitch has not been mirrored off it, as the club announced on Monday a loss of £81m for the past financial year (2015-16), more than three times the deficit from their previous accounts. For a club whose trophy cabinet boasts a European Cup, seven top-flight titles and seven FA Cups, these are dark days. How drastic has their decline been? When Martin O'Neill walked out five days before the start of the 2010-11 season, he left having secured top-six finishes in each of the three previous campaigns. Villa were preparing for a third consecutive year of European football and ought to have been looking up, focusing on how best to mount a challenge for the Champions League places. But since O'Neill's departure - reports suggested he was unhappy at the lack of funds made available for transfers by then owner Randy Lerner - their decline has been dramatic. In the six and a half years that have followed, Villa have collected about half the number of points amassed by Manchester City (262 compared with 521), the team that finished just one place above them in O'Neill's final season. And they have won 197 points fewer than Tottenham, the "worst" performing side from that year's top six. In fact, of every club to have competed in the Premier League and Football League/EFL since the start of 2010-11, only Stockport - now in National League North - have won less regularly. "Villa are one of the biggest clubs in the country - if it were down to size they would be in the top six in the Premier League," said Dean Saunders, who played for Villa from 1992-95 and helped them finish second in 1992-93. "That's what their fans expect, and that is what I would expect from them too. When you think of Villa, with their magnificent support, you should be thinking of a team full of top international players that everyone knows about, pushing for trophies. They are a million miles away from that at the moment." For Saunders, watching the club's slide has made for painful viewing. Their relegation in April with four games remaining - the earliest a team had dropped out of the top flight since Portsmouth in 2010 - was merely the culmination of years of under-investment during Lerner's time at the helm. "The reason they aren't where they once were is there has been a lack of investment in the years since O'Neill left in 2010," he said. "It makes me sad seeing what has happened to them. I feel sorry for their fans, but it was coming. "You can go back to the departure of players like Gareth Barry (2009), James Milner (2010) and Ashley Young (2011). "They never replaced them, or even tried to. Until this season they tried to do things on the cheap and that lack of investment is why they have not stayed with the big-hitters - the big teams, which they are one of. "Villa are bigger than Chelsea, Manchester City, Tottenham and Everton. "Compare them to Tottenham, who were trying to break into the Champions League at the same time as O'Neill was in charge, or Everton, who are trying to do it now - there is no difference in the size of those clubs. Villa are actually bigger than both of them. "The difference is the way they have been run. That is the reason Villa have gone in the opposite direction. "So instead of doing a Spurs, they have done a Sunderland - they were hanging on and just avoiding relegation for the past four or five years, but it was inevitable it was going to happen." Their dire form and off-field issues at the end of last season led Black, standing in following the disastrous reign of Remi Garde, to say that the club "could very easily implode". The downward spiral was supposed to end in the summer when Dr Tony Xia took over from Lerner as owner and, following the short-lived tenure of Roberto di Matteo, appointed Bruce as manager, the surest thing there is to a guarantee of promotion from the Championship. Wasn't Bruce the man to finally end the decline? Despite a poor start to the season and the departure of Di Matteo after 124 days and just 11 league games, Villa were still sixth favourites for promotion with the bookmakers when Bruce was appointed on 14 October. They might have been languishing in 19th place in the Championship, but that optimism came from Bruce's record of securing two promotions to the top flight with Birmingham, and two with Hull. "They're one of the big clubs in this country," said Bruce, who became the sixth man in 12 months to pick the Villa team. "I relish the challenge of trying to take the club where it wants to go and needs to be - and to try to turn around the misfortune we seem to have had over the past few years." Unlike when Alex McLeish - another former Birmingham City manager - took over across the city just five years earlier, there was little opposition to his appointment among the club's supporters. Bruce initially justified that faith, with seven wins from his first 12 games in charge - and only two defeats. Since then - and despite still boasting the best win percentage of any Villa boss since O'Neill - the magic seems to have worn off. Following the 2-1 home win over Burton Albion on Boxing Day, Villa have played 12 games, won twice (their past two matches), drawn at home to Leeds and Preston and lost the other eight. Saunders, though, is convinced Villa have the right man in charge. "I couldn't have picked a better manager than Steve Bruce to turn things around," said Saunders, who played under the former Manchester United defender when he was in charge at Sheffield United. "I have managed in the Championship and it is not so much Premier League players you need, you need players who, mentally, can go to the likes of Rotherham or Burton on a Tuesday night and show the correct attitude and respect to those teams. "It is extra hard for a team like Villa because when they play at home the crowd are waiting for a four-niller, when it does not happen like that. "Mentally it is a war, week-in, week-out. A lot of the time these games are more like an actual battle than a football match, so you need players who can fight. "Sometimes you have to clear the decks and start again before you can really turn things around, but that can take a couple of years. The one thing Villa need now is stability." Villa have spent big - so why has it not worked? 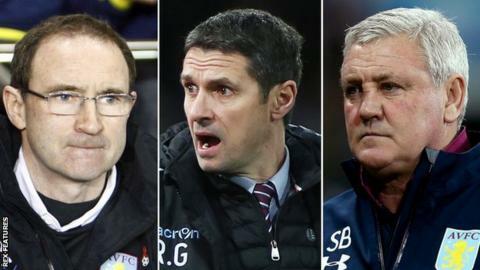 Along with Newcastle, Villa were considered strong favourites for this season's Championship title and, unlike in some previous Premier League seasons, they have backed their managers financially. Much of the money spent first by Di Matteo and more recently by Bruce has been used to try to improve their strikeforce, with about £24m spent bringing Bristol City's Jonathan Kodjia and Fulham's Ross McCormack to the club in the summer, while Brentford striker Scott Hogan arrived in January for a fee which could rise to £12m. But as early as January, three of their summer signings had left the club, as McCormack (£12m) and Aaron Tshibola (£5m) joined Nottingham Forest on loan until the end of the season, while goalkeeper Pierluigi Gollini (£4m) moved to Atalanta on an 18-month loan deal. In the past two transfer windows about £40m has been recouped in player sales. "I think in hindsight you could argue this was always going to be a tough season given the issues the club had the previous year," said Matt Lynch, presenter of YouTube channel The Villa View. "We needed time to restructure even the basics at Villa Park and perhaps attempting to do it over one summer was too much. I think we do have to look at people in charge of the summer recruitment though, like Roberto di Matteo. The strategy didn't pay off." Bruce was not helped by the loss of top scorer Kodjia for a month to the Africa Cup of Nations. Nor could he have foreseen the gate-related problems that would contribute to McCormack leaving the club. Hogan, the newest big-money arrival, failed to score in four appearances before injuring an ankle against Newcastle on 20 February, which will keep him out for up to five weeks. Though Kodjia has arguably justified his transfer fee with 12 goals in 26 league games, Villa's big spending has not consistently translated into goals, as they have the third worst scoring record in the division. Nottingham Forest's Henri Lansbury and Barnsley's Conor Hourihane, who leads the Championship with 11 assists, were signed in January to add creativity to the midfield, but they have provided just one assist and one goal since moving to Villa Park. "The churn of managers has led to chronic instability and uncertainty among the players," said BBC Radio 5 live's Midlands football reporter Pat Murphy. "An average of eight new signings per season since 2010 doesn't lead to a coherent strategy. "Villa have brought in 16 new players in the past two transfer windows, 10 of whom started their recent match against Newcastle. It's hard to expect them to bed in easily and now that the inevitable Bruce bounce of the autumn has worn off, justified questions are being asked of the players' character." So is there any hope of an imminent Villa revival? The fear for any Premier League club relegated to the Championship is that they suffer the kind of fate that befell Leeds, whose financial and ownership issues have been a constant narrative throughout their 13 years outside the top flight. As one anguished caller to BBC WM 95.6 said on a pre-match phone-in two weeks ago: "If even Steve Bruce can't put it right, I can't imagine who can." So is Villa's decline irreversible? Or could they yet re-establish themselves as the force they were during the 1990s? "I can see green shoots of optimism, believe it or not," said Murphy. "For years Villa have needed a director of football to organise a uniform style of play and to finesse recruitment worldwide. They have the right man now in Steve Round - vastly experienced, but he's only been there for five months. "Keith Wyness is an old pro of a chief executive. He also deals directly with the fizzing ideas and energy of Dr Xia, who is very hands-on, no matter where he finds himself in the world. "His contributions on Twitter are always welcome, albeit sometimes gnomic. Dr Xia is a laudable contrast to the lethargic leadership of Lerner in his last few years at Villa Park, where a state of permanent executive stasis existed. "Then there's Bruce. He needs a couple more transfer windows to clear up the mess that's accumulated down the years. You don't get to be Manchester United's captain for five years under the demanding Sir Alex Ferguson without understanding and embracing pressure. Bruce should be judged at Villa this time next year." Saunders takes solace in the presence of Round and Bruce, but is wary of the problems a long Premier League absence can cause. "It is vital that they get up next season, before a gap opens up," said the former Wales striker. "Every season you spend in the top flight is worth £100m thanks to TV money, so every season a team like Swansea or Burnley stay up, they are going further away from Villa. "It is so hard to get out of that division but Villa will get back up there because of the supporters who keep turning up and keep the money coming through the gate. "They will be back - it is just a question of when."